Philly is one of our oldest markets (outside of NYC of course)… we’ve been slinging brew there since March of ‘09. The spirit of repurposing is right at the heart of Sixpoint’s beginnings. The Mad Scientists got their start out of a broken down garage in Red Hook, BKLYN, that over time turned into a full-time production brewery with a rooftop garden. Add great beer and awesome food to these gardens, and we’re naturally pretty stoked about the whole thing. And obviously, the Mad Scientists are getting involved. 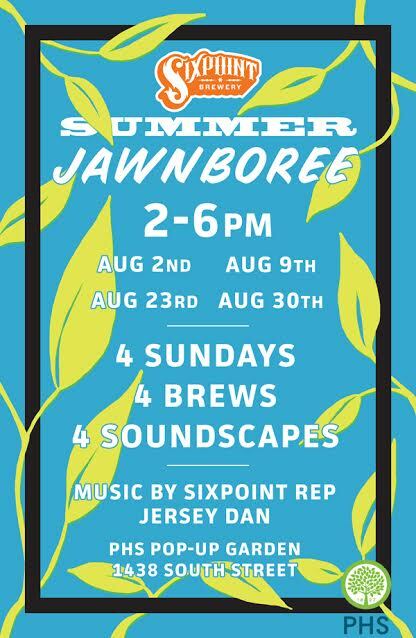 On four Sundays in August, JDan is spinnin records as people relax in the gorgeous PHS Pop-Up Garden. Four Sixpoint taps and great food is also on hand. Come by and check out this awesome urban phenomenon!